-Rifle Grenades renamed Urban Assault Kit. -Riflemen Incendiary Device moved to this ability slot. -Number of smoke shells increased from 1 to 3. -Sprint now only affects infantry within 50m of the ability. -Smoke dropped in the center of the UI reticle. -Added a delay of 2 seconds before the airstrike arrives. -Now requires Schwerer Panzer HQ to be called in; previously required all 3 trucks. -300 manpower; same durability as Defensive Doctrine Concrete Bunkers. -Bunker has 45 sight radius. -Detection Ability: Reveals enemies on the minimap within 90m of the bunker. 50 second duration. No cost. 90s recharge. -Artillery Flares: Deploys OKW-esque within 60m of the bunker. 60 munitions. -Ability recharged shared amongst all bunkers. -Infantry Doctrine Combined Arms now a veterancy 1 passive. Medkits removed. -G43 upgrade from 60 to 25. -Fixed a bug where the British Mortar Emplacement could not be built. -Satchel Charge added to Pioneer Support Package. -Panzer IV H now available from the HQ; requires either the Support Armor Korp or the Heavy Panzer Korps. -Allows conversion of structures for 250 manpower and 30 fuel; adds 6 repair pioneers to converted building and allows infantry to reinforce. -Infrared STG 44s now replaced with Panzer Commander; this ability affects the Tiger. -Now requires all trucks converted to be called-in; same as the King Tiger. -Veterancy 1 Strafe damage from 5 to 2. -Damage from 120 to 160 versus vehicles. -Fixed a bug where the wrong weapon was used on the IL-2 Strafe Rocket Strafe. -Fixed a bug were Infantry Section reinforce cost was set to 35. -Fixed a bug where Airborne Guards’ Suppression Strafe did not require veterancy 1. 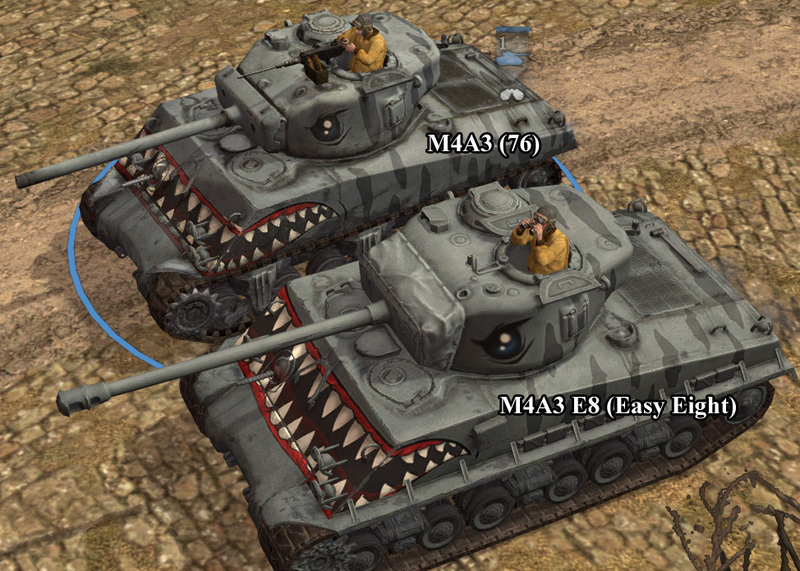 -Fixed a bug where the British M10’s Prioritize Vehicle ability did not function. -Fixed a bug where the Tiger Ace’s Prioritize Vehicle ability did not function when in Spearhead mode. -Now takes up one weapon slot. -Fixed a bug where the weapon was not mutually exclusive with minesweepers. -Damage modifier against heavy cover from 0.5 to 0.75. -Provides Riflemen with Incendiary Grenades; similar to Molotovs. Shares a cooldown with Frags. 30 munitions. 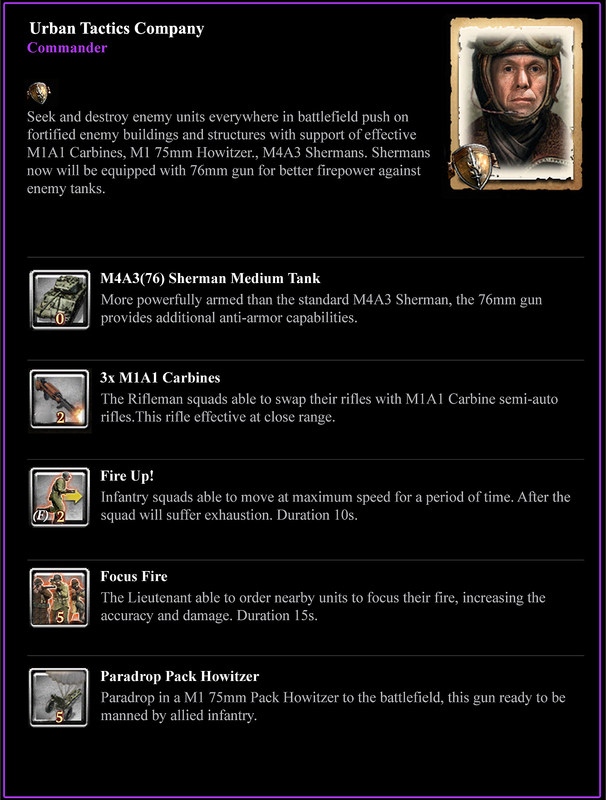 -M4A3 Shermans can now fire a single WP shell at the target position for 20 munitions. -Still provides the dozer blade. -Drops a single smoke shell at the target position. -Infantry will sprint for 20 seconds after the ability is cast. -Still requires either AEC or Bofors upgrade, but is also available if the Company Command Post is purchased. -Fixed an issue where British M10s would not benefit from Hammer Tracking. -Cost from 250 to 280; reinforce cost unchanged. -G43 now takes up 1 weapon slot. -Flare cost from 45 to 35. -Now uses the OKW Combat Blitz ability. -Veteran squad leader increases capture and decapture rate by 20%. -Adds -5% Received Accuracy to the squad. -Now starts at veterancy 1. -Fixed an issue where the Medical Crate had infinite range and no indicator radius. -Medical Crates will no longer inspire friendly units. Cost from 20 to 15. -DP-28 Upgrade now provides Fire Superiority; same ability as Cavalry Riflemen Covering Fire. -Can now be upgraded with PPSh-41s for free; grants access to smoke grenade and equips the full squad with the Shocktrooper PPSh-41s. -Can now upgrade in neutral or enemy territory. -Veterancy 1 ability replaced with “IL-2 Suppression Strafe”: Calls in an airstrike at the target position within 40m of the Airborne squad for 60 munitions. Low damage, but will pin most targets. Share a global cooldown. -Added RGD-33 Grenade; Smoke Grenade locked behind PPSh-41. -Damage against vehicles from 120 to 140. -AOE damage profile against buildings reduced to SCAS Strafe level. -Damage against non-vehicle targets from 120 to 20.